My fiancé, Veiko Huuse, and I had a Holiday vacation at Mykonos during the first weeks of August 2018. We were celebrating his birthday and were able to live some amazing experiences at a place that joins the past and the present with its architecture and culture. This was my first time in Greece and I was very happy to choose this place. Everything, the hotel, the food, water, beach, holiday, people, places were fantastic. This travel was a feast for all our senses and created a unique experience. We travelled from Tallinn to Helsinki, then to Athens and Mykonos, which was quite a long flight considering it is inside Europa. There, we stayed at the 5-star Anax Hotel and Spa http://www.anaxmykonos.gr/. When you Step into the Hotel you are on another planet. This isn’t just Mykonos, it was a pristine beauty of a private oasis within a cosmopolitan destination. Anax Hotel and Spa is a luxury resort with modern architecture without losing connection to the Mediterranean origins. 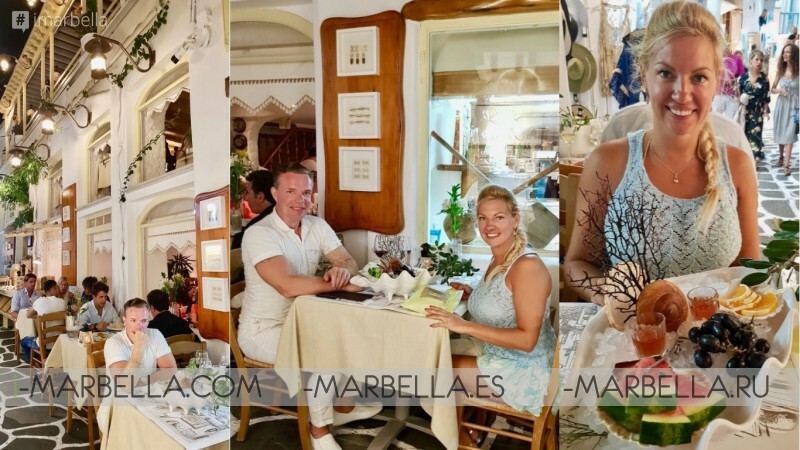 We tried to have a little bit of everything to see Mykonos Town (Chora), went to popular beach clubs and restaurants, had a good time with friends who happened to be in Mykonos and of course some time alone for romantic dinners and relax. We went 2 times Mykonos Town, Chora, which I loved the most. This town has a real sense of Greece and Mykonos. Small streets filled with white houses with blue doors and windows, hundreds of small chapels, and windmills and sunset views at Little Venice. Pasta Fresca Barkia Mykonos since 1978. My best customer service in my life. The way they treated customers was the best I have ever experienced. First looks are important, the welcome presentation and the way the restaurant looked and smelt, and the energy vibe they make you feel were more than a warm welcome. When they welcome you they say “we love you”. It was a busy night and there was a queue in street to get seats. So we felt like going out without dessert or any other drinks and I think the waitress felt it. They let us stay didn't bring bill quickly, as a busy restaurant usually do; instead, she left us for 5 minutes and came back with a dessert menu. So we took one chocolate mousse to share. It was a nice way to say “please stay don't rush, we find tables for people, don't worry”. And at the end, with the bill -which was the smallest in our entire vacations- came nice ice bowl with herb spirit and fruits, and they also gave me the small bag with seashells. It was pure and kind customer service. In Mykonos, there are over 300 small chapels, mostly private. Mykonos have preserved its true unique historical appearance, White one floor houses with different shades of blue windows and doors. The edges of the roof of the houses are round, reason why the wind doesn’t whistle. The ground is mainly light brown and the sea around the island has 50 shades of blue. To get around in Island we took a cab every time, and, a one-way ride depending on the destination was about 20-50€. To get to all the beaches we paid 50 per ride -This was 10-15km-. And from bay to bay you can also take a boat for 5€ each person –Also, a one-way ride-. One day we took a full-beach-club day. We went to Santa Anna Mykonos Beach Club and Scorpios Mykonos beach to eat, drink, and party. Santa Anna Beach Club has pool and beach environments, it is quite a big place that offers quick service and girls know how to ask more tip in quite a pushy way. The music was good, the beach fantastic and the food was abundant. In Greece, there is a lot of food everywhere and it is always good, how can you go wrong with tomato, feta cheese, onion, cucumber, olives, oil, and herbs? In our day, August 9th, a famous DJ was supposed to be there, but I didn't see him; and the only one who was really dancing were us. But generally, it was very nice. Later, we went to the next door to have dinner at Scorpios. The food was good but the place was very crowded, to get to a dinner table you must be 100% pre-booked and there still was a queue all the time. I didn't see where the DJ was, or the dance area, people just danced everywhere were they find space; we left quite early, it was already a long day and all the trip was very windy at the end which was disturbing. On the other hand, dinner at Buddha Bar Beach Mykonos was absolutely amazing. It is on Ornos beach. We had Veiko Huuse birthday celebration dinner with a surprise cake with volcanos and afterward Shisha on the beach, this was a unique experience.